What kind of patients does Dr. Faber treat and what kind of psychiatry does he specialize in? Dr. Faber is a Double Board Certified Psychiatrist in Adult as well as Child/Adolescent Psychiatry. He has also been trained as a Fellow in Forensic Psychiatry. On a typical day, Dr. Faber will evaluate and treat patients who suffer from any number of psychiatric illnesses including depression, anxiety, anger, concentration problems, behavioral problems, sexual addictions, substance abuse, traumatic brain injury, and other organic brain deficits. For those individuals who have encountered troubles with the legal system, Dr. Faber performs a complete psychiatric evaluation potentially including psychological testing, QEEG’s (see more below) , and SPECT scans (see more below). This information is then utilized to write a complete report with specific actions that individual will need to take and follow in order to rehabilitate their brain. Such a plan is intended to support and encourage that person to stay out of legal trouble. Along with providing a comprehensive report for that individual, Dr. Faber will also be able to conduct consultations with attorneys on how best to use this information in a court of law to assist their client. A SPECT scan is a type of nuclear imaging test that measures blood flow. SPECT uses a radioactive substance and a special camera to create 3-D pictures. While imaging tests like X-rays can show what the structures inside your body look like, a SPECT scan produces images that show how your organs work. 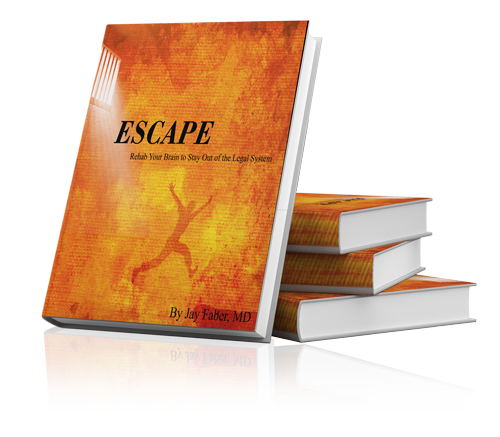 Why did Dr. Faber write "Escape" and what does he hope it will achieve? As a teenager, Dr. Faber began developing a passion for people who would demonstrate a real and genuine interest in promoting change with an ultimate goal of making a difference. Dr Faber became inspired when he observed others go against the grain, work hard, and make something of themselves. Against all odds, he believed such people would send a message of hope and inspiration that anyone can make a difference in the world. This book was written as a tool to help others develop and believe that they can indeed change in real and significant ways. It contains a very strong message to encourage others to take that long, lonely path and see what great things can come out on the other side. For the reader, it was written to give courage, hope, and tenacity to take action, so the new story they create is memorable, majestic, and noble. In essence, Dr. Faber hopes that the book transforms those individuals often negatively labeled as “misfits” into legitimate and worthy example-setting heroes. How can one support Dr. Faber? We request your email address so we can deliver the ebook directly to you. We would also like to keep in touch periodically with any significant updates regarding the book and Dr. Faber’s work. Under no circumstances will your email address be sold or used in any other way. You are always free to unsubscribe from receiving emails. Can you address your book's dedication? The writing of “Escape: Rehab Your Brain to Stay Out of the Legal System” was a very personal endeavor. As is the case with many authors, the writing process was a true labor of love that took place outside my “office hours”: early in the morning, late at night, on weekends and holidays. I have dedicated the book to the U.S. government as it is the U.S. government I owe the extraordinary education I received earlier in my life and enabled me to become a doctor. I also want to serve fellow American citizens as the financial cost of supporting our jails and prisons is staggering. While it may seem like a pipe dream, there is a way to reduce a sizeable tax burden we all face while helping change the lives of those behind bars. What is the best way to secure the book and does it cost anything? You can download it directly from this website. There is no charge. Please sign up here and we will deliver it you electronically. How can I get in touch with Dr. Faber to learn more or to set up an appointment? Does Dr. Faber give speeches, presentations, or interviews? Yes, Dr. Faber does give presentations, speeches and interviews. You can reach Thomas Smith at 404-291-4929 or thomas@drjayfaber.com as he will coordinate scheduling. Who can benefit from Dr. Faber's book? The book was primarily written for those individuals who break the law, many of whom are considered habitual offenders. With that being stated, other people or entities that have encounters with the criminal system may find it very helpful. Parents, siblings, attorneys, judges, counselors, and probation officers should all find it to be a very beneficial resource.